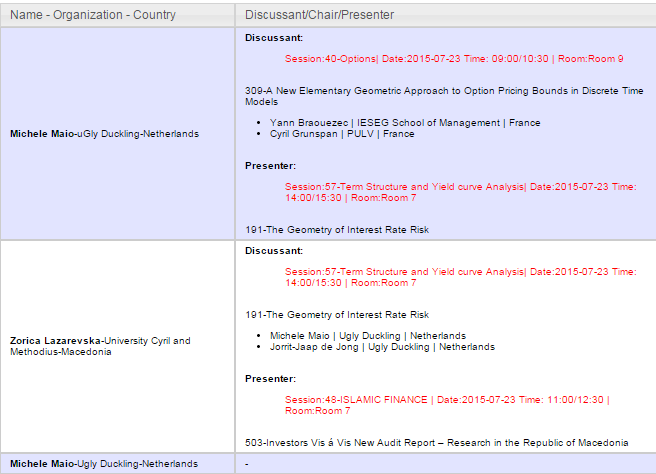 The program of the World Finance Conference in Buenos Aires is now online [update 4/4/2016 resource is no longer online]. UD is on July 23rd. We are happy to announce that our work from last year on interest rate risk has been accepted for presentation at the World Finance Conference. The conference will take place in Buenos Aires (Argentina) on 21-24 July, where we will talk about our geometry paper (and maybe mention our related works). More detailed information about the content of the conference will follow in future posts. Stay tuned! In this paper we describe some new features of the monotone-preserving cubic splines and the Hyman’s monotonicity constraint, that is implemented into various spline interpolation methods to ensure monotonicity. We find that, while the Hyman constraint is in general useful to enforce monotonicity, it can be safely omitted when the monotone-preserving cubic spline is considered. We also find that, when computing sensitivities, consistency requires making some specific assumptions about how to deal with non-differentiable locations, that become relevant for special values of the parameter space. Keywords: Yield curve, fixed-income, interpolation, Hyman, monotone preserving cubic splines. In this paper we consider the process of interest rate risk management. The yield curve construction is revisited and emphasis is given to aspects such as input instruments, bootstrap and interpolation. For various financial products we present new formulas that are crucial to define sensitivities to changes in the instruments and/or in the curve rates. Such sensitivities are exploited for hedging purposes. We construct the risk space, which eventually turns out to be a curve property, and show how to hedge any product or any portfolio of products in terms of the original curve instruments. Keywords: Yield curve, hedging, interest rate risk management. In this paper we describe some new features of Hyman’s monotonicity constraint, which is implemented into various cubic spline interpolation methods. We consider the problem of understanding how sensitive such methods are to small changes of the input y-values and, in particular, how relevant Hyman’s constraint is with respect to such changes. We find that many things cancel out and that eventually Hyman’s constraint can be safely omitted when the monotone-preserving cubic spline is used. We also find that consistency requires including some specific boundary conditions that become relevant for special values of the parameter space. Keywords: Yield curve, interpolation, monotone preserving cubic splines. Ugly Duckling is a consultancy specialised in quantitative finance. Our main focus is on technical aspects, such as product modelling, custom tooling, model validation, research and development. Demo: How to create objects using OOP in MATLAB in under 10 minutes! We build financial models. We do this both within the Ugly Duckling team and embedded in your organization. When building models we often use the existing Ugly Duckling code base and research. This makes the modeling faster and more efficient. We love details. When given the chance, we deep dive into a model and validate its mathematical, financial and implementation details. We also find it a rich experience to explore the models of others and learn for their approach. In most cases we contribute to make an even better model thanks to the feedback we provide as part of the process. Ugly Duckling is dedicated to expand the body of mathematical finance knowledge. To do so we invest in a continuous research effort. These efforts keep us up-to-dated on the new developments in finance. So when you encounter a challenge for which no solution exists in the literature, please call us. We can help.